Not to be confused with RAAF Base Tindal. An F-22 Raptor and two F-15 Eagles from Tyndall Air Force Base participate in a refueling mission with a KC-135 Stratotanker from the Mississippi Air National Guard over eastern Florida, 22 September 2008. 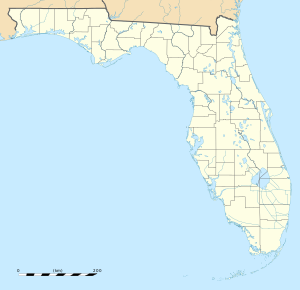 Tyndall Air Force Base is a United States Air Force Base located 12 miles (19 km) east of Panama City, Florida. The base was named in honor of World War I pilot 1st Lt. Frank Benjamin Tyndall. The base operating unit and host wing is the 325th Fighter Wing (325 FW) of the Air Combat Command (ACC). The base is delineated as a census-designated place and had a resident population of 2,994 at the 2010 census. The 325th Fighter Wing’s primary mission is to provide a combat ready air dominance force, train F-22A Raptor pilots and maintenance personnel, and train air battle managers to support the combat Air Force. Tyndall's combat mission is performed by the 95th Fighter Squadron. Training for F-22 pilots is performed in the 43d Fighter Squadron and the 2d Fighter Training Squadron. The 325th Air Control Squadron trains air battle managers for assignment to combat Air Force units. Additionally, wing personnel manage the southeastern air combat maneuvering instrumentation range and provide mission-ready F-15, F-16, and F-22 air dominance forces in support of the Commander, North American Aerospace Defense Command (NORAD) and the Commander, First Air Force (1 AF) / Air Forces Northern (AFNORTH) contingency plans. From 1983 until 2010, training for F-15 Eagle pilots was performed at Tyndall AFB by the 1st, 2d, and 95th Fighter Squadrons in the F-15A, F-15B, F-15C and F-15D aircraft. The 1 FS inactivated in 2006, while the 2 FS and 95 FS inactivated in May and September 2010, respectively. During this time, Tyndall also hosted training for F-15C/D maintenance personnel and intelligence officers assigned to F-15C/D units. The 95 FS was reactivated in September 2013 as part of the F-22 Raptor consolidation plan that moved the 7th Fighter Squadron's aircraft to Tyndall. The 2nd Fighter Training Squadron was activated in 2014 to perform T-38 adversary operations in support of the F-22 training mission. The 325th Fighter Wing is host to more than 30 tenant organizations located at Tyndall Air Force Base, Florida. The wing consists of the 325th Operations Group, 325th Maintenance Group, 325th Mission Support Group and 325th Medical Group. It is also augmented by two Air Reserve Component (ARC) units from the Air Force Reserve Command (AFRC) and the Air National Guard (ANG), respectively. The 44th Fighter Group of the Air Force Reserve Command (AFRC) is an associate unit of the 325 FW and, if mobilized, is operationally-gained by the Air Combat Command (ACC). Otherwise, it operates at Tyndall as a geographically-separated unit (GSU) of AFRC's 301st Fighter Wing at NAS JRB Fort Worth/Carswell Field, Texas. The 44 FG flies and maintains the F-22A Raptor in partnership with the 325 FW. Headquarters, First Air Force at Tyndall is part of the Air Combat Command (ACC), ensuring the air sovereignty and air defense of the continental United States. As the CONUS geographical component of the bi-national North American Aerospace Defense Command and air component of United States Northern Command (USNORTHCOM), 1 AF also provides airspace surveillance and control and directs all air sovereignty activities for the continental United States. 1 AF primarily consists of Active Guard and Reserve (AGR) and Air Reserve Technician (ART) personnel of the Air National Guard (ANG), augmented by additional part-time "traditional" Air National Guard and Air Force Reserve personnel, as well as active duty personnel of the U.S. Air Force, U.S. Navy, U.S. Marine Corps, U.S. Army, and U.S. Coast Guard. Operationally-gained by ACC, 1 AF is the only Numbered Air Force in the Air National Guard and is responsible for all Air National Guard F-15 and F-16 fighter units. The 53d Weapons Evaluation Group (53 WEG), is an Air Combat Command tenant organization that reports to the 53d Wing (53 WG) at nearby Eglin Air Force Base. Among its subordinate squadrons at Tyndall, the 53 WEG manages offshore weapons ranges over the eastern Gulf of Mexico (EGOMEX), manages target drone programs ranging from sub-scale target drones to a fleet of QF-16 Fighting Falcon Full Scale Aerial Targets (FSAT) based on conversion of older F-16A and F-16C aircraft. The 53 WEG previously managed QF-4 Phantom II FSATs, most of which were converted F-4E and F-4G aircraft. The 53 WEG also serves as primary manager for "William Tell", a biennial air-to-air weapons and aerial gunnery meet and competition for fighter aircraft held by the United States Air Force during even-numbered years. The 125th Student Flight is a training unit based out of Jacksonville, Florida. Established in 2018, the Tyndall AFB detachment of the 125th serves as a holding unit for Florida Air National Guard trainees. Once enlisted, Air Guardsmen awaiting basic training and tech school will be sent to the Student Flight detachment nearest to their home. The Tyndall detachment is located on a separate compound within the main air base, where instructors teach recruits basic skills and knowledge regarding the Air Force and the Florida Air National Guard. The 337th Air Control Squadron (337 ACS) is a geographically-separated unit (GSU) of the 33d Operations Group, 33d Fighter Wing, at Eglin AFB, Florida. As an Air Education and Training Command (AETC) unit, the 337 ACS conducts Undergraduate Air Battle Manager Training (UABMT) at Tyndall AFB. All of the Air Force's Air Battle Managers are initially trained at Tyndall prior to proceeding to Tinker AFB, Oklahoma for actual positional training in the E-3 Sentry AWACS aircraft or Robins AFB, Georgia for the E-8 Joint STARS aircraft. Prior to October 2012, Tyndall AFB was home to the Air Force Civil Engineer Support Agency (AFCESA). Following AFCESA's merger with the Air Force Center for Engineering and the Environment and Air Force Real Property Agency, it was renamed the Air Force Civil Engineer Center (AFCEC), but AFCEC headquarters remained with the other two previous activities which had relocated from the former Brooks AFB to Lackland AFB, part of Joint Base San Antonio, Texas. As a tenant unit at Tyndall, AFCEC is a subordinate unit of the Air Force Material Command (AFMC). Its activities at Tyndall include the AFCEC Energy Directorate, Operations Directorate and Readiness and Emergency Management Directorate. The Air Force Research Laboratory's Materials and Manufacturing Directorate at Wright-Patterson AFB, Ohio maintains a research facility at Tyndall as a geographically-separated unit. Tyndall Field was opened on 13 January 1941 as a gunnery range. The airfield was named in honor of 1st Lt Frank Benjamin Tyndall (1894–1930). With the establishment of the United States Air Force in 1947, the facility was renamed "Tyndall Air Force Base" on 13 January 1948. In December 1940, a site board determined that Flexible Gunnery School No. 9 would be located 12 miles (19 km) southeast of Panama City, Florida on East Peninsula. On 6 May 1941, Army and local dignitaries held an official ground breaking for the school. Panama City's mayor, Harry Fannin, dug the first spade full of sand, and Colonel Warren Maxwell, Tyndall's first commander, wielded the first ax on the stubborn palmetto plants, so common on the East Peninsula. The site was covered with pine and palmetto trees, scrub brush, and swamps. Bulldozers worked around the clock to clear the brush and fill in swamps. Although construction was well underway, the base lacked a name. Congressman Bob Sikes suggested naming the school in memory of Lieutenant Francis B. Tyndall. A native of Sewall's Point, Florida, Lieutenant Tyndall was a fighter pilot during World War I, Silver Star recipient, and commander of the 22d Aero Squadron, who was credited with shooting down six German planes well behind enemy lines in 1918. While inspecting Army fields near Mooresville, North Carolina on 15 July 1930, Tyndall's plane, Curtiss P-1F Hawk, 28–61, crashed, killing him instantly. On 13 June 1941, the War Department officially named the new installation Tyndall Field. On 7 December 1941, the first of 2,000 troops arrived at Tyndall Field. The first class of gunnery students began in February 1942. Although construction was incomplete, instructors and students began preparing for the first class. The first class of 40 gunnery students began on 23 February 1942. Of the thousands of students passing through the Tyndall gates, the most famous was actor Clark Gable, a student here as an Army Air Forces lieutenant during late 1942 and part of January 1943. Foreign student training began at Tyndall in 1943 with French Air Force gunnery students being the first and Chinese students following later that year. When World War II ended, Tyndall Field was demobilized. The base fell under the control of the Tactical Air Command (TAC) in 1946, but this only lasted three months, as Tyndall became part of the Air University (AU). Tyndall Field was subsequently renamed as Tyndall Air Force Base when the U.S. Air Force became a separate service in 1947. In September 1950, Tyndall became an Air Training Command (ATC) installation, designated as the USAF Pilot Instructor School. The base also trained Ground Controlled Intercept (GCI) operators as well as interceptor pilots & flight crews for the Air Defense Command. Under the auspices of this training system, GCI trainees would direct TF-51H Mustangs against "enemy" A-26 Invaders. In late 1952, both aircraft were replaced by Lockheed T-33 Shooting Star jet trainers. Airborne radar operator students would begin their training aboard radar-equipped TB-25 Mitchells, then transition to either Lockheed F-94 Starfire or Northrop F-89 Scorpion aircraft. North American F-86F and F-86Ds were eventually added to the training program as Air Defense Command (ADC) units were equipped with them. In September 1957, Tyndall became an Air Defense Command, later Aerospace Defense Command, base until October 1979 when ADC was inactivated and all its bases and units transferred to Tactical Air Command. Tyndall was headquarters of the ADC 73d Air Division in the late 1950s, and the NORAD Southeast Air Defense Sector from 1960 to 1979. ADC's 20th Air Division based at Tyndall was responsible for the air defense of virtually all of the southeastern United States during the 1960s and 1970s, while ADC's 23d Air Division, also based at Tyndall, was responsible for air defense forces in the upper midwest and south central United States. Air Defense Weapons Center McDonnell F-101F-71-MC Voodoo, AF Ser. No. 58-0277, at Tyndall AFB in August 1972. This aircraft was later sold to and operated by the Canadian Armed Forces. Convair F-106A-130-CO Delta Dart AF Serial No. 59-0119 of the Air Defense Weapons Center, Tyndall AFB Florida, 1979. This aircraft was retired in 1983, converted to a QF-106 Drone and expended over the White Sands Missile Range near Holloman AFB, NM on 13 September 1991. In the late 1950s into the 1960s, the base transitioned into the North American F-100 Super Sabre, F-101B, F-102A and TF-102B, F-104 Starfighter, and the F-106A and B aircraft, training interceptor pilots for ADC assignments. The base served as a stopover and refueling point for ADC aircraft deployed to Florida during the Cuban Missile Crisis, to be redeployed to other bases in the southeast shortly thereafter. The base maintained an alert facility from which the F-101 Voodoo and F-102 Delta Dagger interceptors were scrambled to intercept unknown aircraft. Tyndall shared training for the F-102 aircraft with Perrin AFB, Texas until Perrin AFB's closure in mid-1971. On 1 July 1956 Tyndall AFB became the station operating for the third phase of the ADC mobile radar program, being designated as TM-198. Activated by the 678th Aircraft Control and Warning Squadron, Tyndall became operational to support the CIM-10 Bomarc surface-to-air missile program at Hurlburt Field. In 1958 the site was operating with an AN/FPS-20 search radar and a pair of AN/FPS-6 height-finder sets to support the 4751st Air Defense Missile Squadron. In 1962 the search radar was upgraded and re-designated as an AN/FPS-64. On 31 July 1963, the site was redesignated as NORAD ID Z-198. During 1965 Tyndall AFB joined the Semi Automatic Ground Environment (SAGE) system, feeding data to DC-09 at Gunter AFB, Alabama. After joining, the squadron was re-designated as the 678th Radar Squadron (SAGE) on 1 June 1965. Also in 1965, Tyndall became a joint-use facility with the Federal Aviation Administration (FAA). It also received a Back-Up Interceptor Control (BUIC) II, and later BUIC III, capability to perform command and control functions. Tyndall retained this function until the 1980s. On 1 March 1970, the 678th was redesignated as the 678th Air Defense Group. On 1 October 1979, this site came under Tactical Air Command jurisdiction with the inactivation of Aerospace Defense Command and the formation of ADTAC. On 1 March 1983 the 678th Air Defense Group was inactivated and Tyndall became the home of the NORAD 23rd ADS (Air Defense Squadron) and operated the Southeast Regional Operations Control Center (SE ROCC), later renamed Sector Operations Control Center (SOCC). The height-finder radar, modified as an AN/FPS-116 c. 1977, was removed c. 1988. In 1995 an AN/FPS-64A was performing search duties. The site now operates an ARSR-4 search radar under FAA control as part of the Joint Surveillance System (JSS) as site "J-11". In 1991, Tyndall underwent a reorganization in response to the Department of Defense efforts to streamline defense management. Headquarters, First Air Force, what had predominantly been the Numbered Air Force for the Air National Guard, moved from Langley AFB, Virginia, to Tyndall. With the disestablishment of Tactical Air Command (TAC) in 1992, Tyndall was temporarily transferred to the Air Combat Command (ACC) and then to the Air Education and Training Command (AETC) in July 1993. Today, Tyndall is the home of the 325th Fighter Wing, providing training for all F-22A Raptor pilots. In 2012, with the gaining of a combat-coded F-22 squadron, Tyndall AFB returned to Air Combat Command, after a 19-year tenure in AETC. On 10 October 2018 Hurricane Michael made landfall as a low end Category 5 hurricane, at Mexico Beach just to the east of the base. A weather station near the base recorded a wind gust of 130 miles per hour (210 km/h) before it failed, according to the National Hurricane Center advisory shortly after landfall. The National Weather Service, in a preliminary report released later in the month, stated that the maximum sustained wind speed at the base was 75 knots (139 km/h; 86 mph)[a] and the maximum wind gust was 121 knots (224 km/h; 139 mph), both from 60°. However, in a later interview with Aviation Week on 27 October 2018, U.S. Air Force General Mike Holmes stated that, based on other data, the actual peak wind speed was closer to 172 mph. Ninety-three Air Force personnel remained on the base during the storm, while the base's remaining 3,600 personnel and their families (a total of over 11,000 individuals) were evacuated beforehand. Air Force officials described the damage imparted to the base by the hurricane as "catastrophic", with all of the base's facilities being declared "unlivable" as of 12 October 2018. While efforts to repair the base are underway, there is no confirmed time of completion on the repairs, according to 325th Fighter Wing Commander Col Brian Laidlaw. In the stead of Hurricane Michael, airmen assigned to the 325th Fighter Wing have been told they will be away from the installation for a significant amount of time. Tyndall is home to 55 F-22 stealth fighters. Thirty-three were flown to Wright-Patterson Air Force Base near Dayton, Ohio before the storm. Seventeen F-22s were left behind with many of them becoming damaged. The extent of the damage to the planes is not known. According to US Senator Bill Nelson and Congressman Matt Gaetz, the aircraft left behind were not in a condition to be flown. A spokesperson for the Air Force said that none of the F-22s have been destroyed and that they "believe at this time that they are all repairable." According to the United States Census Bureau, the base has a total area of 14.5 square miles (37.6 km2). 14.5 square miles (37.5 km2) of it is land, and 0.077 square miles (0.2 km2) of it (0.44%) is water. As of the census of 2000, there were 2,757 people, 663 households, and 653 families residing on the base. The population density was 73.1/km² (189.2/mi²). There were 663 housing units at an average density of 17.6/km² (45.5/mi²). The racial makeup of the base was 77.8% White, 14.2% Black or African American, 0.5% Native American, 3.1% Asian, <0.1% Pacific Islander, 2.8% from other races, and 4.6% from two or more races. Hispanic or Latino of any race were 8.3% of the population. There were 663 households out of which 81.0% had children under the age of 18 living with them, 90.8% were married couples living together, 5.1% had a female householder with no husband present, and 1.4% were non-families. 1.2% of all households were made up of individuals and 0.2% had someone living alone who was 65 years of age or older. The average household size was 3.57 and the average family size was 3.59. On the base the population was spread out with 37.9% under the age of 18, 17.5% from 18 to 24, 42.4% from 25 to 44, 2.1% from 45 to 64, and 0.1% who were 65 years of age or older. The median age was 22 years. For every 100 females, there were 121.1 males. For every 100 females age 18 and over, there were 130.7 males. The median income for a household in the base was $34,191, and the median income for a family was $33,897. Males had a median income of $25,857 versus $19,821 for females. The per capita income for the base was $11,281. About 3.8% of families and 3.6% of the population were below the poverty line, including 5.3% of those under age 18 and none of those age 65 or over. ^ The report contains a note that "anemometer height is 10 meters and wind averaging is 2 minutes". The sustained wind speeds in tropical cyclones are usually measured by 1-minute average wind speed at a height of 10 meters (33 ft) above the ground by the National Hurricane Center, while other parts of the world use the average over a 10-minute period. ^ a b "Profile of General Population and Housing Characteristics: 2010 Demographic Profile Data (DP-1): Tyndall AFB CDP, Florida". U.S. Census Bureau, American Factfinder. Archived from the original on 11 September 2013. Retrieved 15 March 2012. ^ "Units". www.tyndall.af.mil. Archived from the original on 5 May 2017. Retrieved 3 May 2018. ^ "301st Fighter Wing > Units > 44th Fighter Group". www.301fw.afrc.af.mil. ^ "Detachment 1, HQ FLANG". Fl.ng.mil. 2 August 2016. Retrieved 31 October 2018. ^ "Total Force for Team Tyndall > Tyndall Air Force Base > Display". www.tyndall.af.mil. ^ "Total Force effort enhances AFNORTH DSCA mission". ^ "CONR-1AF (AFNORTH) > Home". www.1af.acc.af.mil. ^ "53rd Weapons Evaluation Group". ^ "337th Air Control Squadron". ^ "Air Force Research Laboratory". ^ "Tyndall". Daytona Beach Morning Journal. 4 December 1966. p. 5. Retrieved 3 November 2015. ^ a b c d e f g h i j k "Tyndall Heritage Factsheet". Tyndall Air Force Base. 15 November 2012. Archived from the original on 21 October 2016. Retrieved 21 October 2016. ^ "Hurricane Michael Hurricane Michael now making landfall". NASA SPoRT. Retrieved 10 October 2018. ^ "Category 4 Hurricane Michael makes landfall on Florida Panhandle". fox10TV.com. Retrieved 10 October 2018. ^ Brown, Daniel (10 October 2018). "Hurricane Michael Intermediate Advisory Number 16A". National Hurricane Center. Archived from the original on 10 October 2018. Retrieved 10 October 2018. A wind gust of 130 mph (210 mph [sic]) was recently reported at a University of Florida/Weatherflow observing site near Tyndall Air Force Base before the instrument failed. ^ "Post Tropical Cyclone Report... Hurricane Michael". National Weather Service. 26 October 2018. Retrieved 31 October 2018. ^ Trevithick, Joseph. "USAF Had Faulty Data About Whether Hangars Full of F-22s Could Survive Hurricane Michael". The Drive. Retrieved 1 November 2018. ^ Calvert, Scott; Kamp, Jon (15 October 2018). "Air Force Surveys Damage at Florida Base After Hurricane Michael". Wall Street Journal. Retrieved 18 October 2018. ^ Bushatz, Amy (15 October 2018). "Tyndall Air Force Base Unlivable: How You Can Help". ^ Sisk, Richard (17 October 2018). "Many Families Will Never Return to Tyndall After Hurricane, Officials Say". ^ "'Widespread, Catastrophic Damage': Every Building at Tyndall AFB Totaled By Hurricane Michael". Fox News. 12 October 2018. Retrieved 18 October 2018. ^ "'It Will Be Years' Before Life At Tyndall Air Force Base Returns To Normal". ^ a b Dave Philipps (11 October 2018). "Tyndall Air Force Base a 'Complete Loss' Amid Questions About Stealth Fighters". New York Times. Retrieved 12 October 2018. ^ Dave Philipps (17 October 2018). "Exposed by Michael: Climate Threat to Warplanes at Coastal Bases". New York Times. Retrieved 18 October 2018. ^ a b Gabriel, Melissa (17 October 2018). "Hurricane Michael: Fate of costly stealth fighter jets at Tyndall Air Force Base still unknown". Pensacola News Journal. USA Today. Retrieved 18 October 2018. ^ Ockerman, Emma (16 October 2018). "The Air Force won't say how many F-22s it lost to Hurricane Michael". Vice News. Retrieved 18 October 2018. ^ "101st Air and Space Operations Group stands up at Tyndall". ^ "823rd RED HORSE Squadron/Detachment 1". ^ Pike, John. "Silver Flag". www.globalsecurity.org. ^ "Tyndall Air Force Base > Home". www.tyndall.af.mil. Archived from the original on 2 January 2018. Retrieved 3 May 2018. ^ "Geographic Identifiers: 2010 Demographic Profile Data (G001): Tyndall AFB CDP, Florida". U.S. Census Bureau, American Factfinder. Archived from the original on 11 September 2013. Retrieved 15 March 2012. ^ "CENSUS OF POPULATION AND HOUSING (1790–2000)". U.S. Census Bureau. Archived from the original on 8 July 2010. Retrieved 17 July 2010. Wikimedia Commons has media related to Tyndall Air Force Base and Tyndall Army Airfield. University of South Florida Libraries: Tyndall Target This weekly newsletter was published for personnel of the Army Air Force Flexible Gunnery School during World War II. This article incorporates public domain material from the United States Air Force website http://www.tyndall.af.mil. This page was last edited on 19 April 2019, at 16:50 (UTC).